I am doing some spring cleaning of our photobucket, and realized here’s another un-posted recipe. Another one of our stir-fry standby, when we can find fresh shrimps, that is. These shrimps were not the largest, but they were fresh Carolina shrimps, and they were quite flavorful. 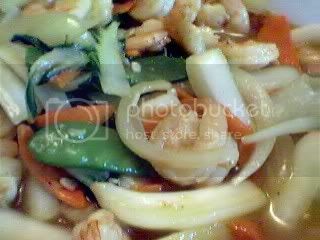 For this version, these shrimps were stir-fried with bok choy, snow peas and carrots, along with garlic and onions. Flavored with a bit of oyster sauce, and black pepper, it’s another quick and easy meal. Hi Stel! hehe, I am doing the same, having my midnight snack in front of the pc 😉 Yes, there’s plenty of carolina blue crabs too, but sadly, I’m the only one that likes the little guys…the girls and hubby likes the big dungeness types. I think the blue crabs are more flavorful. Hi Obachan! yes, we are lucky that we get “some” fresh seafood 🙂 considering were so far from the shore. I’m glad you came by! I love your stirfry photo. You’re lucky that you can get fresh Carolina shrimps! have a great workweek JMom!